Turn off power from the DC power source using the circuit breakers. Caution - Do not proceed with these instructions until you have turned off the power from the DC power source through the circuit breakers. Identify the parts that you will use to assemble the DC input power cables. 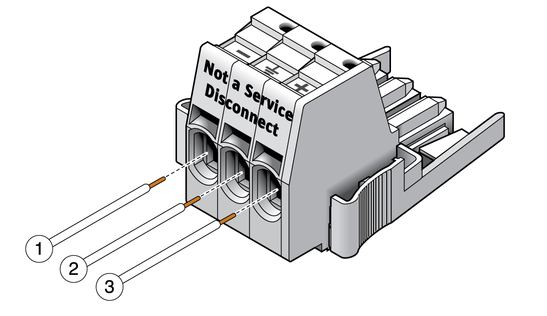 For each cable, you need the three parts shown in the figure below. These items are provided in the shipping kit that came with your server (DC models only). Note - Depending on the DC power source, the -48V or -60V (negative terminal) might be marked with a minus (-) symbol, and the -48V or -60V Return (positive terminal) might be marked with a positive (+) symbol. Strip 1/2 inches (13 mm) of insulation from each of the wires coming from the DC power source. Do not strip more than 1/2 inches (13 mm) from each wire. Doing so leaves uninsulated wire exposed from the DC connector after the assembly is complete. 1 Strip the insulation 1/2 in., or 13 mm. 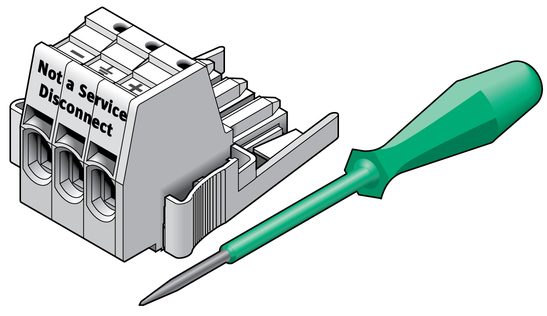 Open the cage clamp by inserting the cage clamp tool (or small screwdriver) into the rectangular hole directly above the hole in the DC input plug where you want to insert the first wire, and push in to open the cage clamp. Feed the exposed section of the appropriate wire into the round plug hole in the DC input plug. 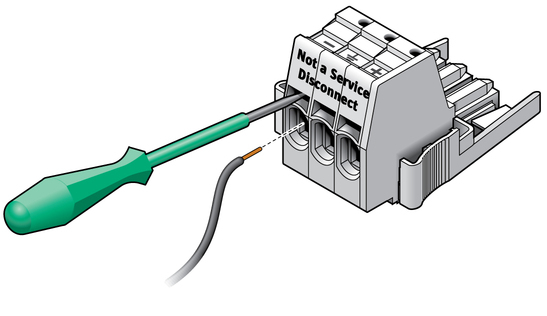 Note - If you need to remove a wire from the DC input plug, insert the cage clamp operating tool or a small screwdriver into the slot directly above the wire and push in. Pull the wire from the DC input plug. Remove the cage clamp tool to secure the wire. Repeat Step 5 and Step 6 for the other two wires to complete the assembly of the DC input power cable. Repeat this procedure to create as many DC input power cables as you need for your unit.